In 2008, before my time taking part in the Cannonball Read, I read and loved Mark Harris’s Pictures at a Revolution: Five Movies and the Birth of the New Hollywood. For those that are interested, that book covers the 1967 Best Picture Oscar race, cataloguing how that year’s nominated films – Guess Who’s Coming to Dinner, The Graduate, In the Heat of the Night, and Bonnie and Clyde each highlight the changes both in Hollywood and in the culture. I suggest it wholeheartedly. When I saw via Goodreads that Mark Harris had a new book out, Five Came Back: A Story of Hollywood and the Second World War, I got it from my library and (eventually) dug in. Unfortunately, this one just didn’t sing for me in the way that Pictures at a Revolution had. In Five Came Back Harris tells the story of five Hollywood directors who joined the war effort in World War II to be of patriotic use, and to document the war. We meet and follow John Ford, William Wyler, John Huston, Frank Capra, and George Stevens as they leave behind a Hollywood system experiencing both highs and lows and enter a world to which they are unfamiliar. Between them these five men were the scene of almost every major moment of America’s involvement in the war. They served in every branch of service—army, navy, and air force and all theatres of war. They were present at the biggest moments in the American campaign from Midway, Normandy, to the fall of Paris and the liberation of the Nazi death camps or stateside in the shaping of the message out of Washington, D.C. and chronicling the effects of the war on its soldiers once they returned home. As it did for so many others, World War II divided the lives of these men into before and after. However, as a reader I became less and less interested in some of these narrative threads and instead wished to hear more about Wyler and Stevens. The beginning of this work was simply far too detailed to pull me into the book. I understand that Harris is after giving the reader the general feeling of the time, but it just dragged and dragged – for nearly 150 pages. When it comes to drawing in a reader for a work of non-fiction I often think its best start broad with big sweeps of information to draw the reader into your preferred level of detail. Just because we the reader are interested enough to choose to read your book does not mean we are interested enough to be as informed as you assume we should be, just saying. Other than that issue, and the general slow pace of the text, and my disinterest in half of its main characters are leaving me rating this a three, but it keeps all three because what worked for me worked well. I wasn’t really sure about All the Light We Cannot See when I decided to put a hold on it at my library (which has quickly escalated into an addiction in case you were wondering, I have approximately 20 books on holds which will deliver them to my library over the next 6 months). I based my selection of the book on its winning Goodreads Book of the Year –Historical Fiction and the glowing review of a friend on that site. My only concern was that I have read a lot of books set in 1930s/1940s Europe and wasn’t sure that I really wanted to spend more time there just now. As it turned out that wasn’t actually a problem and I devoured this masterly crafted work and sped through it over the course of three days. The structure of this book is its biggest strength. We are on two timelines throughout – in one we are in August 1944 in Saint-Malo, France during the firebombing. In the second we travel from 1934 to August 1944 chronicling the movements and links between the characters in Saint-Malo. This doesn’t seem like it should be a gripping structure, but boy is it. Each chapter alternates between different characters, and for approximately 90% of the book we are moving between Werner, orphan in Germany’s coal country, radio/electrical genius and soon to be sucked up into the Nazi war machine and Marie-Laure, daughter of the master of keys and locks and the National Natural History Museum in Paris, and on the run with her father who has been tasked with keeping a piece of the collection safe from the invading German forces. Oh, and she’s been blind since the age of 6. It’s basically the same as the set up for Eleanor and Park, minus the love story and the knowing each other part. I can’t seem to capture in words how captivating this narrative device truly is in this outing. 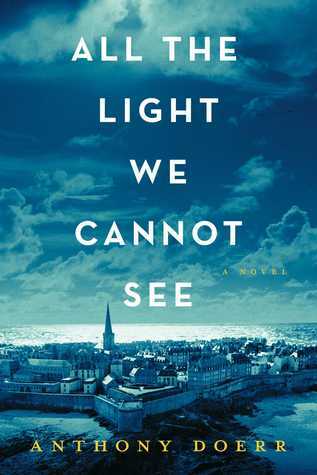 Everywhere All the Light We Cannot See is mentioned the fact that Anthony Doerr spent a decade working on it is mentioned. Initially I was annoyed, I don’t tend to put a lot of weight into how long or how short someone’s writing process is. Everyone’s process is their own, you know? But as I worked my way through the stories of Werner and Marie-Laure, and the details started to line up, and the tension and mood were so expertly crafted, and the topics so lovingly brought to life, I understood why people wanted me to know how long Doerr spent, because the craftsmanship of a decade shines through like a well-made piece of furniture. If there was a small stumble it was near the end. I had assumed that the ending of the book and the various narrative threads would wind up at the end of the war, and probably around August 1944, which we kept bouncing to and back from. It doesn’t. The narrative makes several additional jumps forward in the final 30 pages and while it was perhaps nice to see where these characters ended up, it was also somehow more than I needed. I think if the last jump forward hadn’t happened, I would have been completely satisfied. This is however, my first five star book of the year, and I don’t give those out lightly. If you like historical fiction, read this. There isn’t much of the plot I feel comfortable sharing, since there’s a fair bit of discovery that goes on during the course of the book. 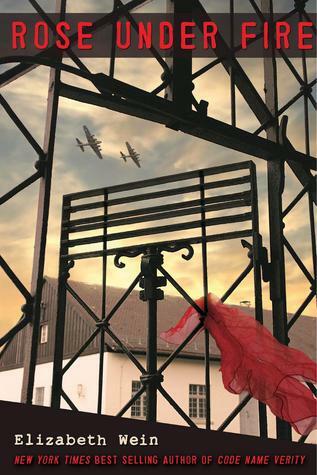 From Goodreads: Oct. 11th, 1943-A British spy plane crashes in Nazi-occupied France. Its pilot and passenger are best friends. One of the girls has a chance at survival. The other has lost the game before it’s barely begun. When “Verity” is arrested by the Gestapo, she’s sure she doesn’t stand a chance. Her Nazi interrogators give her a simple choice: reveal her mission or face a grisly execution. As she intricately weaves her confession, Verity reveals her past, how she became friends with the pilot Maddie, and why she left Maddie in the wrecked fuselage of their plane. On each new scrap of paper, Verity battles for her life, confronting her views on courage, failure and her desperate hope to make it home. But will trading her secrets be enough to save her from the enemy? I’ll admit that the first 50 or so pages of the book dragged on and on and on for me. Verity’s voice is not solidified early on, and that may be Ms. Wein’s intent given what Verity has just endured, but between that problem and the overload of technical information it was slow going initially. But, as Verity finds her footing in the writing the story really takes off, particularly as she begins recounting the genesis of her friendship with Maddie. Perhaps what I love best about this book, and what earned it four stars, is that Code Name Verity is at its core the story of two best friends. I mean, sure, it’s also a war story, a spy story, a bit of a mystery, but it’s really the story of what female friendship is. And that was lovely. I’ll admit that I was surprised to see this book marked as YA, but since its theoretically a coming of age tale I suppose that works fine, but it shouldn’t stop you from picking the book up and reading it if you haven’t already. I was granted an ARC of this book via NetGalley in return for a fair and honest review. This book’s expected publication date is June 29, 2014. There are lots of books out there about Nazi Germany and World War II. Literally thousands and thousands. But there are few that bring the realities of day to day life which Germans were experiencing to light for the modern reader. By choosing to share the cache of letters she found in her family home, Hedda Kalshoven brings one such slice of life to us. And we are the better for it. The correspondence discovered by Hedda focuses around her mother Irmgard Brester, nee Gebensleben, who was born in Germany in 1907. Immo, as she was known to family and friends, took part in the War Children Transport which took children from war-torn Germany to the Netherlands in 1920 following the Great War. Immo would stay in touch with her foster family and write and visit them often in the following years, eventually falling in love and marrying the youngest son of her Dutch foster family. She and August Brester returned to the Netherlands to live. Immo was therefore separated from her birth family in Germany by 400 km, and eventually the Nazi border. Immo’s letters during the Second World War provide for the reader the experience of the occupied. Through the letters to and from Immo and four generation of her extended family over nearly thirty years, the rise and eventual fall of Hitler are chronicled as is the daily life of both civilians and service persons. Originally published over a decade ago, the discovery of Hedda’s uncle Eberhard’s diary chronicling his time as a soldier in the Wehrmacht has provided an additional dimension to one family’s tale, highlighting what one soldier experienced on various fronts of the war, and what he was willing to share with his family. Edited by Hedda, it is her annotations which places the accounts you are reading into the overall chronology of events of the conflict. This worked to a great degree with the Preface written by Peter Fritzsche which introduces the work to us, the American readers of this work now available to us. The extended Gebensleben/van Alten/Brester clan are well spoken, cultured, educated, and on all sides and extremes of the incoming Nazi regime and eventual war. While I found the editing job well done, highlighting different family members over different periods, it did still drag a little in the middle of the book when we are reading almost exclusively from Immo’s mother Elisabeth. But that may be because to the eyes of this reader she was a true believer in the National Socialist movement. It’s easy to understand the reasoning she held; the fear of the incoming Bolshevism from Russia, knowing what we know it is often difficult to accept her positions. An interesting and insightful read. If you are interested in this time period and are looking for a wealth of primary source material highlighting the average citizen both within the Nazi borders and the occupied Netherlands I recommend it.